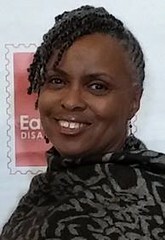 COLUMBIA, Mo 02/15/15 (Beat Byte) -- Living up to her alma mater's 2014 ranking as one of the top 50 fashion schools in the world -- top 20 in the US -- Stephens College alumna Zina Wilson Arthur made several dresses for the women of Selma, the hit movie about Martin Luther King, Jr.'s fight for equality during the 1960's. 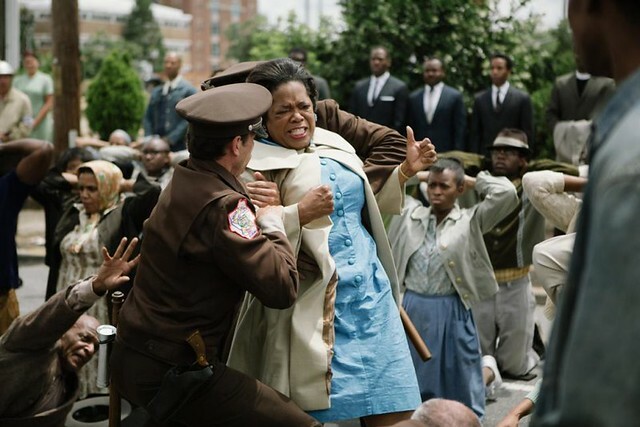 "I was familiar with Selma, so that was important to me," she said. 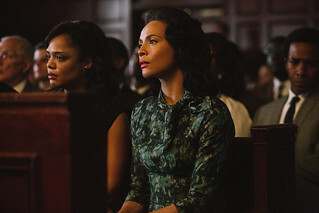 A 1978 graduate of the Columbia-based university, Arthur made the turquoise dress Oprah Winfrey wears depicting activist Annie Lee Cooper struggling with police (below); a burgundy dress Winfrey dons in a voting scene; and the multi-colored flowery green print dress the actress Carmen Ejogo wears as King's wife Coretta Scott King (above, with the actor David Oyelowo as MLK; and below). Arthur also made all but one garment featured in the "aftermath" scene. 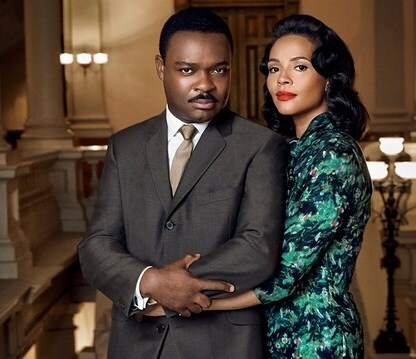 The "Selma" gig is her first feature film foray, after a long career as a fashion designer, tailor and patternmaker with theatre and television work. She landed the silver screen job the old-fashioned way: with a friend's referral. "I heard Ruth Carter was the designer" for the film's fashions, Arthur explained. "I’d hope to someday meet her, so I was thrilled." The Big Screen brought some big challenges, including "having to keep in mind just how large the garments will appear," Arthur said. "Everything is blown up, so you’re evaluating everything you see. Every angle counts." Fast, furious, and often merciless, a film business career would have seemed an unlikely choice to Arthur when she was a Stephens student. She didn't take a fashion design course because "I was scared of it. I’d heard it is so fast-paced," she said. "Speed is not my gift, and going into film and TV is a lot of 'hurry up.'" A knack for sewing was a skill Arthur brought to Stephens she honed into patternmaking. "One of the very good things about Stephens was that it was so hands-on so quickly," she said. That hands-on approach honed another skill Arthur brought to 'Selma' -- the conscience of a perfectionist. She was still evaluating her work even after the film hit theatres. "I had to see it for a second time," she said. "The first time, I found myself evaluating the costumes so much." The lessons of Selma for the nation lay in King's unforgettable words, that we judge each other by the content of our character, not the color of our skin. The lessons of the movie "Selma" -- for Arthur, and today's grads -- include patience, perseverance -- and for that young student once afraid of a fast-paced class, new-found courage nearly 40 years later. "I had to face my fear and go ahead and do something that’s not my strength," Arthur said.